As my gluten free granola has been so popular , I thought I would try to make an oat free version as many Coeliac’s cannot tolerate any form of oats. 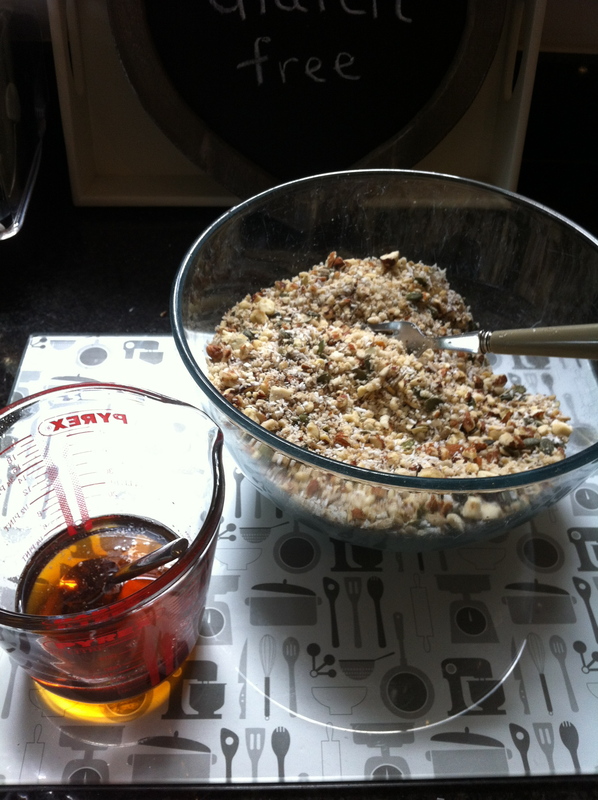 Firstly I used the food processor to coarsely chop up all the nuts . 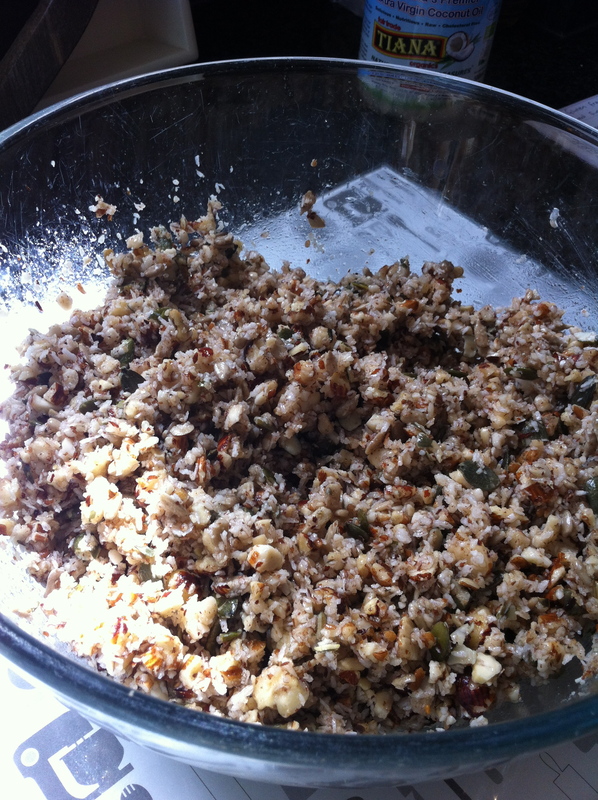 I added almonds, hazelnuts , pecans, and brazil nuts 100 grams of each. Then I added 100 grams of desiccated coconut and 50g of roughly chopped pumpkin seeds and 50g of roughly chopped sunflower seeds using the food processor. These can be left whole if you prefer. Then I melted 150 ml of maple syrup and or honey, Agave syrup can also be used. 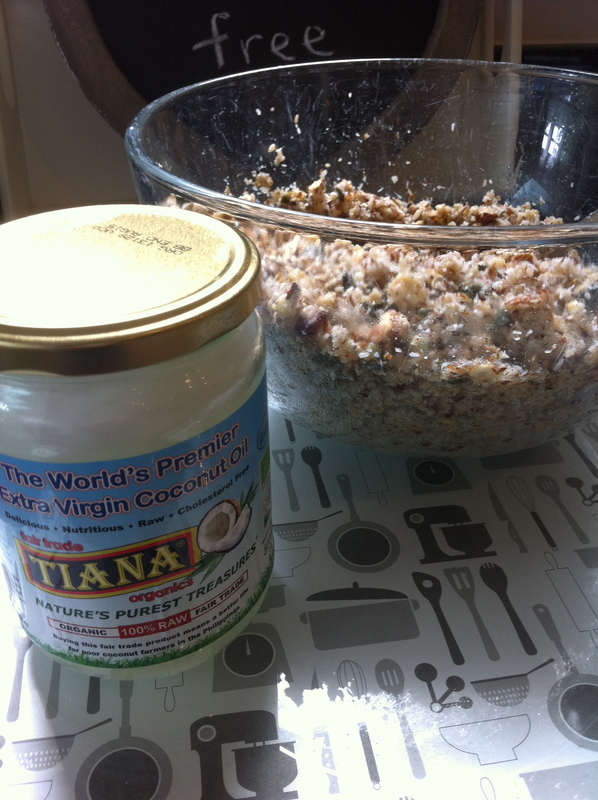 To this I added melted coconut oil approximately 50 ml but you can add more if you prefer. Coconut oil is great, as its a healthy oil. Stir into dry ingredients until all is well coated, and spread onto two greased baking trays. 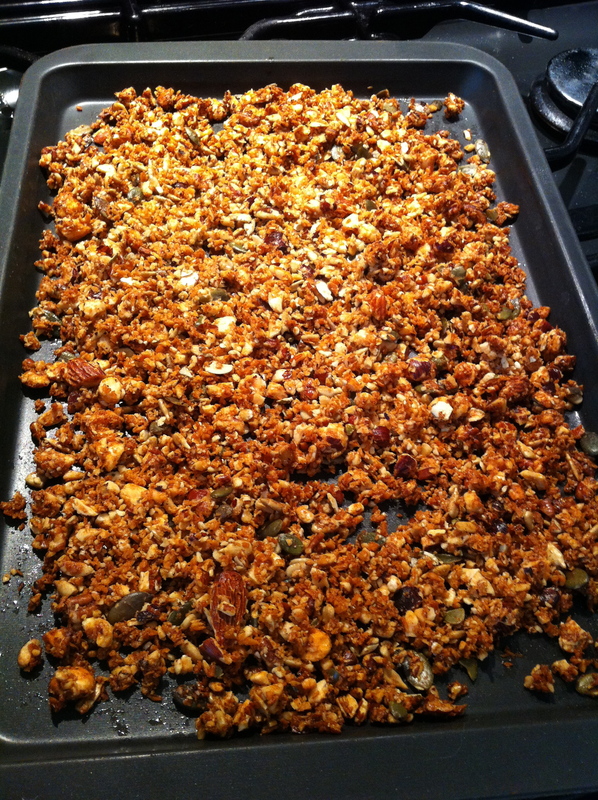 Cook in pre heated oven for 7 mins then mix around to make sure all the granola changes to a golden brown colour. Pop back in the oven for a further 7 mins. Cool, and store in air tight container. I always label mine gluten free and put a date on too. Will keep fresh for a month. But it never lasts that long! Delicious served with full fat greek yoghurt and fresh berries. Good with gluten free ice cream too. 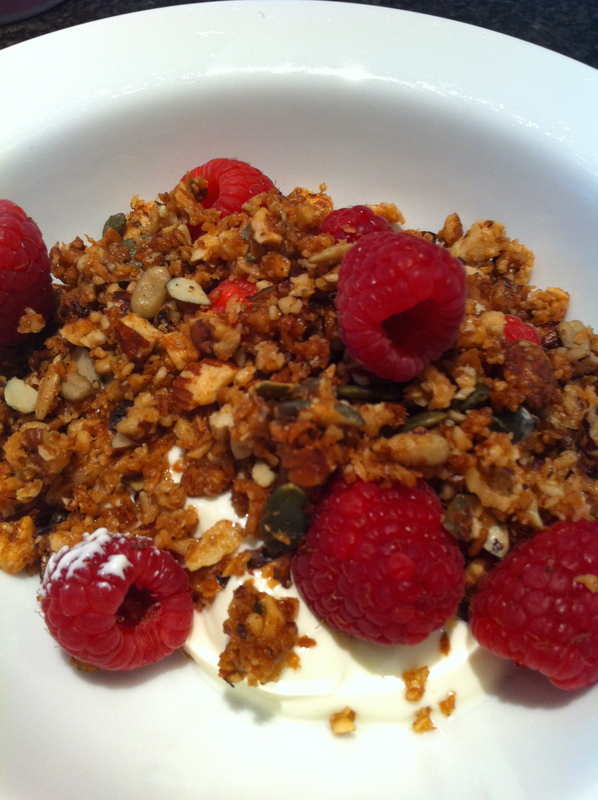 Recently I have made this granola using more coconut oil about 100ml, you could use even more as it is a good healthy fat. Then I used less maple syrup about 100ml as I am trying to avoid using too much sugar. Hi thanks for yummy recipe. Do you think it would taste ok with almond milk on for breakfast? I made this tonight and it’s wonderful! I did not use any maple syrup or honey. I used olive oil in place of the coconut oil. This is amazing granola! Thank you for the recipe!! I think I may not have used enough coconut oil.. my granola was still quite loose after I took it out of the oven. Is this the right texture or should I add more liquid?